When the millennium dome (remember that!) was first opened its strap line to attract visitors was – “one amazing day!” Such a “sound bite” could well apply to the very first Easter day as we shall now discover. As the sun rose some women visited the tomb to anoint Jesus’ body with perfume (Mark 16 v 1), preoccupied with the huge problem of who would roll away the stone from the entrance to the tomb (Mark 16 v 3.) Despite all that Jesus had said to them about his suffering, death and resurrection (Matthew 16 v 21; 17 v 23 & 20 v 19), coupled with the images that he had used of the temple (John 2 v 19) and Jonah and the great fish (Matthew 12 v 40) the women went to the tomb expecting to find a dead body, their faith in his proclaimed resurrection having been extinguished. Upon the women’s arrival at the tomb there was a violent earthquake, then an angel appeared and rolled back the stone; while the Roman guards shook with fear at this supernatural demonstration. 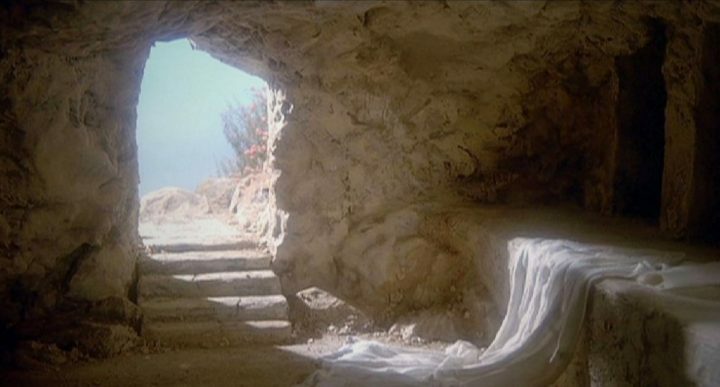 The angel then directly addressed the women – “He is not here; he has risen” (v 6), before inviting them into the tomb to inspect the pristine grave clothes, and then commissioning them to go and share the news of resurrection with his disciples. So off they went having seen with their eyes and heard with their ears the evidence of resurrection. As the women hurried from the tomb to tell the disciples, they were met and greeted by none other than the risen Christ himself. They clung to him and worshipped him as they rejoiced in their personal experience of the risen Lord.